It’s a good idea to investigate RV financing before you even start shopping for an RV. That way, when you find a motorhome or RV trailer that you like, you’re prepared to move ahead quickly, focusing on features and equipment of the RV. And, when your salesperson offers you the dealership’s “attractive terms,” you can compare them with what you have already researched, and see if the dealer’s terms are indeed attractive. Or you can negotiate better terms with the dealer. Make him earn your financing business. Financing an RV is different than financing a car. Because an RV can qualify as a second home, you can deduct the interest you pay on it. And you’re likely to own an RV longer than you might own a car, so you can finance the RV for longer terms. RV loans between 5 and 20 years are common. This can reduce your payment to a very reasonable monthly amount, leaving you with more cash on hand that you can put into investments that hopefully will pay a higher rate. 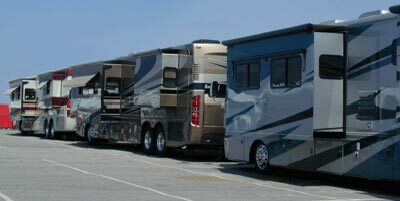 Just as there are companies that specialize in RV insurance, there are specialists in RV financing. Sometimes they have specials, with “Zero-down Loans,” or limited-time low interest rates. Check with some of them as well as the RV dealership for the best terms and service. Your approval and ultimate interest rate are dependent on your credit history, amount of down payment and proof of income, of course. As you shop for a good loan, avoid any that would impose prepayment penalties for paying the loan off early. Also, look closely at the potential fees and financing costs of each potential loan. The Good Sam Club' s vehicle-financing program, www.GoodSamRVFinance.com, has favorable interest rates for both new and used RVs. The RV must have sleeping, kitchen and toilet facilities. You must live in the RV for at least 14 days each year. You cannot claim another second home or RV.